Overview - When their obnoxious and over-served best man, Lumpy (Tyler Labine) unexpectedly dies at their destination wedding in Phoenix, bride and groom Kristin and Scott are forced to cancel their honeymoon and fly home to the snowy Midwest to arrange for his funeral. But getting Lumpy's body back to Minneapolis is just the start of their adventure, as the well-intended sacrifice, surprises at every turn. When it comes to moviemaking, drama and comedy are far from being mutually exclusive genres. In fact, some of the best films the industry has to offer frequently defy simple classifications, blending humor and tragedy in entertaining and heartbreaking ways. Ted Koland's directorial debut, 'Best Man Down,' attempts to navigate this decidedly gray area between laughs and tears, and though it's a well meaning effort, the first time filmmaker can't quite balance the movie's wildly shifting tones. Never sure what kind of comedy or drama or dramedy it really wants to be, the flick ultimately feels tonally confused and sadly ill-conceived, failing to hit most of the emotional beats it's going for. It's not that I just didn't know whether to laugh or cry, it's that I far too rarely felt moved to do either. After their wedding night, Scott and Kristin (Justin Long and Jess Weixler) wake up to discover that Scott's best man, nicknamed Lumpy (Tyler Labine), has tragically passed away. Forced to cancel their honeymoon, the newlyweds instead hit the road to notify Lumpy's loved ones of his untimely death. But as they learn more and more about their departed friend's life, they soon realize just how little they seemingly knew him. As new twists and turns are revealed, the pair encounter a young teenager, Ramsey (Addison Timlin), who may hold more answers about what kind of man Lumpy really was. Initially, the film cuts and back and forth between two seemingly disparate storylines -- segueing between Scott and Kristin's wedding (and its tragic aftermath) and Ramsey's troubled home life. Unfortunately, these shifting perspectives often feel at odds with each other, as both plotlines have a distinctly different feel to them. Even worse, the wedding/untimely death narrative never gels on its own. Things start off feeling like a generic, light comedy, but after tragedy strikes, the script attempts to blend humor with legitimate drama, and this union never ends up working out. The movie's erratic sense of humor clashes with its emotional goals and sometimes morbid content, and frequent attempts at funny, awkward interactions all end up falling flat. Likewise, the weight of Lumpy's death doesn't really come through on a dramatic level, and for much of the runtime the characters seem oddly relaxed about the whole situation. With that said, the Ramsey storyline on its own is actually decent (though familiar), and once we start to learn more about the nature of her relationship with Lumpy (via flashbacks), the movie does settle into a more cohesive tone. On that note, once the two storylines intersect in the third act, the movie becomes a lot more engaging and even develops a few genuinely sweet and heartfelt moments that connect (more or less) as intended. In fact, there's one specific line and another emotional breakdown near the end that hit me surprisingly hard and rang very true, making me wish that the whole film could have found a more consistent vibe earlier on. There really is some solid potential here, and the cast are all good given the uneven material they have to work with. Several sequences are rather entertaining and affecting on their own -- it's just a shame that they rarely fit together in a satisfying manner. Cementing a unified tone can be a tricky balancing act for any filmmaker, veteran or newcomer alike, and though the script's well-meaning mixture of humor and tragedy is ambitious, first-time director Ted Koland can't quite juggle the movie's conflicting temperaments. Many scenes -- and even individual lines -- often seem like they're from completely different films, giving the final product a very disjointed feel. Still, the last act does eventually find a more effective equilibrium, and there are some worthwhile insights peppered throughout related to death, grieving, and friendship. A simple but problematic little film, 'Best Man Down' never fully recovers from the inherent difficulties of its wobbly premise, but the flick's ultimately heartfelt conclusions might appeal to some viewers. 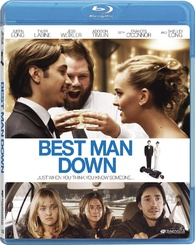 Magnolia brings 'Best Man Down' to Blu-ray on a single BD-25 disc housed in a keepcase. After some skippable trailers, the disc transitions to a standard menu. The packaging indicates that the release is Region A coded. The movie is provided with a 1080p/AVC MPEG-4 transfer primarily in the 2.35:1 aspect ratio. Though not exactly impressive, this is a very solid image that renders the modest content well. The digital source is mostly clean and artifact free, but there is some minor banding visible during fades, and marginal noise does crop up in darker scenes. The picture veers a little toward the soft side, though overall clarity is still pleasing, offering good fine details and textures. While some scenes have a comparatively flat look, depth is decent throughout. Colors are modest and natural, and white levels and blacks are both nicely balanced. With that said, the image can look a tad dim in certain in-door shots. 'Best Man Down' isn't exactly a visual stunner, but outside of some minor issues, the transfer offers an authentic, pleasing, and fitting picture. The film is presented with an English DTS-HD MA 5.1 track, along with optional English SDH, French, and Spanish subtitles. Though it gets the job done, this is a rather basic and generic mix. Speech is clear and easy to understand with no balance problems. Outside of dialogue, however, the track is relatively quiet. Music gets solid stereo separation, and there is some decent effects work across the front soundstage, but the mix has a very small sense of space. Some minimal ambiance is spread around the room, but surround activity is mostly negligible and the basic design work is never very immersive. Likewise, the track has a comparatively flat range that lacks some of the dynamics found on other contemporary releases. The film's content doesn't exactly call for a bombastic mix, but the sound design here is a little too basic, resulting in a front-loaded and forgettable track. Magnolia has provided a small collection of supplements. All of the special features are presented in 1080p with Dolby Digital 2.0 sound and no subtitle options, unless noted otherwise. Outtakes (HD, 6 min) - This is a fairly amusing collection of flubs, improvs, and missed takes. Interviews (HD) - Interviews with Justin Long (3 min) and director Ted Koland (5 min) are viewable separately. The participants talk about the production, story, cast, characters, shooting in Minneapolis, and overcoming (or not overcoming) tonal challenges with the script. AXS TV: A Look at Best Man Down (HD, 3 min) - Presented in 1080i, this is a glorified trailer with some snippets of the previous interviews thrown in. Trailer (HD, 2 min) - The film's trailer is presented in 1080p with Dolby Digital 5.1 audio. 'Best Man Down' offers an odd mixture of comedy and drama that sadly never really gels. There are some heartfelt observations in the third act, but the runtime's wildly uneven tone leads to a confused and frequently dull viewing experience. The video transfer is good, and though very basic, the audio mix does what it needs to with no major issues. Supplements are pretty slim, however, yet fans might appreciate the interviews and outtakes. This is a decent disc for a well-meaning but problematic directorial debut. While the flick has serious issues, there might be enough worthwhile material peppered throughout to justify a rental.